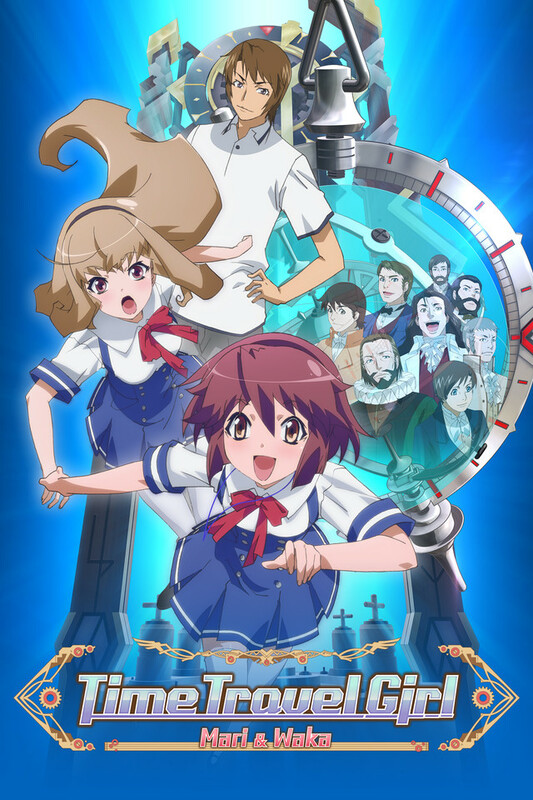 My unintentional time-travel theme continues with a short, sweet anime called Time Travel Girl. My husband and I ran across this series while trawling VRV (an anime streaming service that offers content from Crunchyroll, Funimation, and others), and while the series wasn’t earth-shattering, there were a lot of things we really enjoyed about it. The hero of Time Travel Girl is Mari Hayase, a young girl whose father has been missing for three years. Mari knows that her dad, Eiji, is a scientist whose job requires a lot of travel, some of which causes him to be gone for long stretches of time, but she doesn’t know much more than that. This most recent absence is his longest yet, and Mari and her family are starting to wonder if he’ll ever return. Then, one fateful day, Mari is hanging out with her friend Waka, and they come across a strange, ratty-looking science book. When Mari opens it and touches a page, the book and the necklace she’s wearing both begin to glow. Mari disappears, and a few moments later, she finds that she’s been transported back in time. She is sent back to the sixteenth century, where she meets William Gilbert, a scientist whose work centered around magnets. As Mari later learns, her special necklace, given to her by her father, is a time-travel device that’s linked up to a machine her father built a few years ago. When Mari touches a page from the mysterious science book while wearing the necklace, she is transported back to the time of the scientist shown on the page. With help from her friend Waka and Waka’s brother, Shun, she goes on a tour through time, meeting the scientists who made groundbreaking discoveries that led to the way we use electricity today. During her adventures, Mari keeps running into her missing father, who she finds has been traveling through history the whole time, trying to ensure that the scientists’ discoveries still occur the way history intended. Sometimes Mari helps her father in these endeavors—and sometimes she keeps events moving as they should all by herself. In the present time, a colleague from Eiji’s past is working to track him down as well—but not because he’s worried about Eiji’s well-being. Eiji’s colleague discovers that Eiji used the funding he gave him to create a time machine, and now he wants to profit from Eiji’s work, no matter the consequences. Will he find Eiji before Mari does, or will Mari and her dad succeed in their adventures and make it back home to their own time? The main difference this series has from other anime I’ve seen is that it’s deliberately educational. The viewer follows Mari on her travels as she meets pivotal characters in the history of electricity, such as Benjamin Franklin, Heinrich Hertz, and Thomas Edison. Along with the brief history lesson every episode affords, each one ends with a mini science lesson in the form of live-action clips showing an experiment that uses the scientific concepts the episode explored. The educational side of the anime is a lot of fun, and while it makes it pretty obvious that the series is geared toward kids, it doesn’t feel oversimplified, and it elegantly explains the concepts at hand without getting too complicated. This aspect may be meant to teach kids about science, but I certainly learned a thing or two myself! An educationally focused show like this one runs the risk of the story being nothing more than a vehicle for the knowledge the series is trying to impart, but thankfully, Time Travel Girl didn’t fall into that trap—though the story may be told for a purpose beyond just the story itself, the frame of the series is well told, and it’s engaging enough to stand on its own feet. Plus, since anime tends toward the wildly fantastical, it’s kind of refreshing and fun to see a story that’s based in real history, even with the far-fetched element of time travel. And it’s obvious that the series’ creators meticulously researched the historical figures portrayed in each episode—every figure is faithfully represented, and we get to learn lots of interesting details about their lives and work through Mari’s adventures. This anime would be an ideal one for introducing the nerdy kid in your life to the world of anime in an approachable way—it has some features that will seem familiar to them, presented via a different storytelling style. And the overall plot is compelling, without getting too intense or involved. It’s also a great one to enjoy as an adult; the story is well-paced, and balances high-stakes tension with more low-key, humorous moments in an artful and satisfying way. Add that to the fact that you might learn some fun facts you didn’t know or had forgotten about the history and science shown in the series, and you have a well-rounded, delightful anime. Whatever your age or interest level in the subject matter presented in Time Travel Girl, you’re likely to find something to enjoy in this series, whether it’s the fun, earnest characters, the sci-fi aspects, the fun facts, or the appealing animation style. If you’re looking for something on the lighthearted side that still has some good depth and unique plot elements, I’d recommend giving this one a try!